What's THAT all about? Hillary wants us to think the best way to end racism is with even more racism? And if the answer is 'yes', then my question becomes who's gonna save America from Maxine Waters? So, What Are We Supposed To Think HERE? When Hillary Clinton joined Mayor Bill De Blasio on stage at New York City’s annual Inner Circle Dinner, no one expected things to turn racist. But that's exactly what happened when the Democratic duo attempted to tell an ill-advised joke. "She should return the money for the ‘love of the Democratic Party’ to the DNC for its use." Hitlery could care less about the DNC. When you are a "True Narcissist" no one matters but yourself. 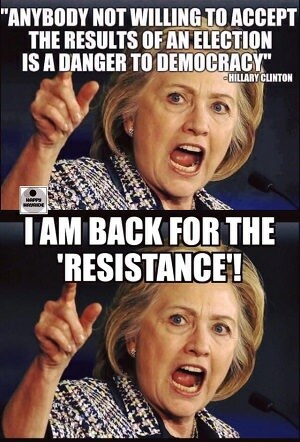 Several officials with the Democratic National Committee (DNC) are demanding that Hillary Clinton return over a million dollars that the organization paid her political group for her campaign email list and other resources, reports the Huffington Post's Daniel Marans. So far, the DNC has paid over $700,000 to rent the campaign's list. Nancy Worley, chairwoman of Alabama's Democratic Party and 2016 Clinton supporter said “She should return the money for the ‘love of the Democratic Party’ to the DNC for its use." Could it be lined with Kevlar? Hmm! Back stabbers must be prepared you know. 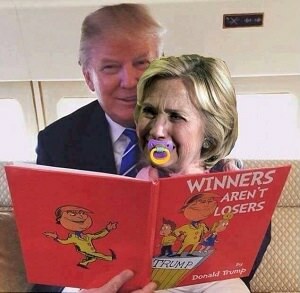 Years from now she'll still be on her world wide 2008 & 2016 sore loser, explanations trail sitting in her wheel chair speaking on "Why I Lost X 2"! Here she is again in the news now! She's campaigning endlessly! 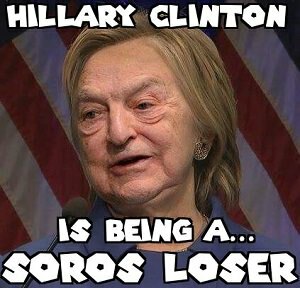 On Thursday, former Secretary of State and two-time failed presidential candidate HRC gave her highest priced paid speech ever, effectively receving nearly $1 million from the Democratic National Committee (DNC) to speak at the Women’s Leadership Forum, an annual Democrat fundraiser. 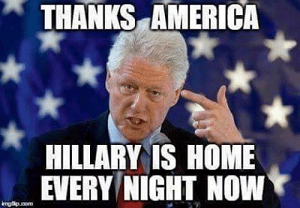 The Clintons need to get paid. They just have to get paid for all the good they have brought to the Democratic Party over the past couple of years—like a total election defeat and the fracturing of the party. Yet, even with the party reeling from their wounds—wounds Hillary had a hand in inflicting with her shoddy campaign—the lady needs that dough. If you’ve ever seen the film "Killing Them Softly," which details a hitman completing an assignment for the mob, Brad Pitt ends up doing two jobs and wants to be paid accordingly. The film is set during the 2008 election. As Pitt meets with his contractor, Obama is delivering a speech, which is mocked by Pitt. “America is not a country, it’s just a business. Now, f**king pay me,” he says as the movie closes. This line, that mindset is very applicable to Mrs. Clinton. B. J. Clinton, the hubby, should have spoken too to double their take! They've gone from being a past First Family to America's present Worst Family! True or False - Yeah! I'm not going to watch it either today or tomorrow! With 43 pages, and I've read 'em all, I don't remember seeing this video to date, here. 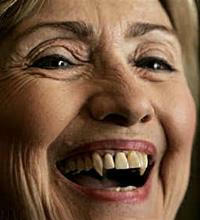 Hitlery is bound to join Nancy Pelo$i in ranting on our POTUS about using the derogatory name for humans as animals. Hell! The libs have forgotten their biological classification of species! We'z animals too in this Kingdom with way too many kings! 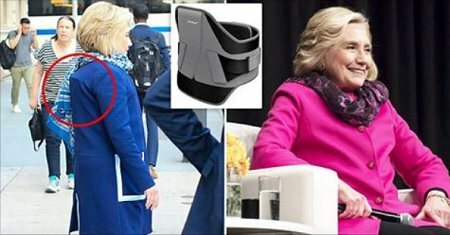 Re: Is Hillary Wearing A Back Brace? I don't wanna write good ones Riddick, so I will write bad ones! Now the news today on Michael Savage's web page questions why she's donned a heavy winter coat to speak at her Harvard award show on a 90 + degree May day! It seems her back brace was showing. Heck! Maybe she wears one to keep her upright so as to not fall down in public! Her moment has passed, she was a terrible candidate, and her endless claims of victimhood are tiring rather than inspiring. No one is clamoring for another Clinton run in Hollywood or other leftist hotbeds. They want a new blockbuster, not a sequel to failure. 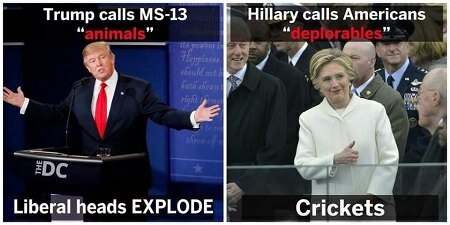 Yet Hillary is up to something and it's not something we didn’t already know. Onward Together, formed in May of 2017, is a 2020 campaign vehicle in waiting. Is she really going to make a third run for the White House? The odds are zero that she is playing community organizer just to be a kingmaker. When it comes to money and power, the Clintons assume charity begins at home. With the Democratic Party locked in battle between its far left and its far, far left wings, no single leader has emerged from the 20 or so Dems in line for a shot at the nomination to unite it. 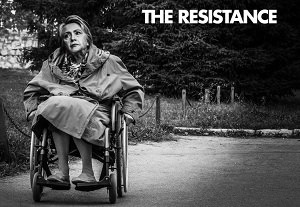 Clinton is trying to play that role by being mother hen to fledgling activists drawn to politics by their hatred of Trump. First, w;ith no clear front-runner for the nomination, Clinton remains the closest thing to an incumbent. She’s also got numerous advantages, from name recognition to campaign experience to an off-the-shelf Cabinet, that could give her a head start. Third, looking ahead to the 2020 primaries, she sees no reason to fear the favorite daughters and sons in key blue states. And please — forget Sanders and Joe Biden. Sanders is already 76 and Biden, at 75, has never been a viable candidate for president and still isn’t. Does Clinton want to go for it? Doubters should recall the line about pols who get the presidential itch: There are only two cures — election or death. Besides, the third time could be the charm. Hitlery, does not bother me as much as those who "worshipped" her. And the ones that still do. “Mueller is either a complete moron, which he is not, or he overlooked the biggest counterterrorism cases in U.S. history. It involved Hillary Clinton, the Clinton Foundation, Uranium One and, of course, the destruction of all the emails and evidence and her secret server, and on and on and on it goes, and he (Mueller) ignored it all. Thanks for that HRC story and link Doka! Writing "just awful" ain't enough! 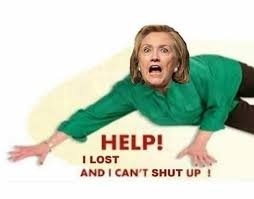 A Hillary in a Prayer Plea!